As we come closer to the shocking conclusion of Bates Motel Season Four, Unfaithful brings us that growing sense of danger, of horror, of Norman Bates' inevitable fate. Norman Bates (Freddie Highmore, who also wrote the episode), is not accepting the various 'changes' that have gone on since his time in Pineview. Of particular disdain is the marriage of his mother, Norma (Vera Farmiga), and Sheriff Alex Romero (Nestor Carbonell). The passive-aggressive nature of Norman knows no bounds, everything from making snide remarks about the large-screen television and spaghetti Westerns that Romero likes to Norman's flat-out demand to Romero that he should divorce his mother. Romero is excessively patient with Norma, but this situation is growing impatient, even angry, at how she insists on not telling Norman that their marriage is not a marriage of convenience. Things come to a head at what should be a nice family event: picking a Christmas tree with Dylan (Max Thieriot) and his love, Emma (Olivia Cooke). Norma confronts her namesake over him going behind her back to tell Romero that he should divorce her, and he for his part responds by throwing up. As Dylan and Emma start planning their lives together, Norma attempts to try to reconcile Romero and Norman by having them all three share a meal. However, Norman still is overtly hostile, insisting he can get a job to pay for his insurance and thus, pay for his own treatments. Romero and Norma finally stand up to him, telling him that they are in love and won't divorce. Norman is now fully enraged, angry that Norma has for all these years held onto him for his entire life and now is being cast off. He vents his frustration by chopping wood, but when Romero comes to him to get him to have some sense, Norman Bates starts threatening Romero with the ax until he launches onto the side of the door, screaming, "I HATE YOU! I HATE YOU!" Someone has Mommy issues, I'd say. Perhaps some of my unenthusiasm for most of Unfaithful comes from the fact that it wasn't a professional writer who penned the episode, but one of the actors. I can't quite shake the idea that if Highmore were not playing Norman Bates, he wouldn't have been given such a plum assignment. Even if it had been written by someone with more experience, I would have found fault with the repetitive nature of 'change'. Everyone is going through 'change' of some kind: Norma's struggle with a new relationship, Emma's new lungs, Dylan's new life, Norman's new cuckoo-bananas mind. The endless repetition of 'change' and about how much 'change' there was appears to be a bit of overboard. One or two mentions of it, that's understandable. The many times that it was mentioned, however, was becoming forced. There's also the matter of Dylan and Emma. Our beloved Dylemma had practically nothing to do in Unfaithful, and it's to the episode's discredit that they could have easily been eliminated without losing much. The subplot of Rebecca Hamilton (Jaime Ray Newman), the former banker/Romero's lover picked up by the DEA before being able to flee to Indianapolis at least moved something forward, but Dylemma? However, there were good things within Unfaithful. 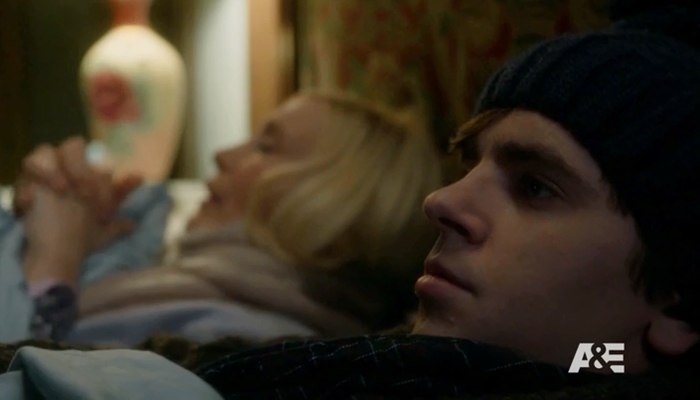 Highmore's final meltdown is frightening and so well-acted. Farmiga still continues to be the best thing in Bates Motel, her torn nature of balancing the fears for Norman and her own desires as a woman making for fascinating watching. Her refusal to be honest and direct with her son are compounding the inevitable tragedy of it all. As a person, you grow frustrated by how Norma, even after Romero essentially threatened to kill Romero, refuses to do anything. I would have thought at that point, even I would have said Norman Bates needs to be locked up in a mental institution. He used an ax in a menacing and threatening manner, so angry that he was this close to losing all control and potentially murdering someone. There was also a nice wink to the future, when we see Norman in a shawl at a rocking chair. The coldness of the house is not just within the building, but within the heart of Norman Bates. Unfaithful had some great moments thanks to Highmore (the comedy of him vomiting at the idea his mother actually wants to stay with Romero). It isn't the best episode this season, but it moves the story forward to some really great, shocking moments leading to the season's finale.